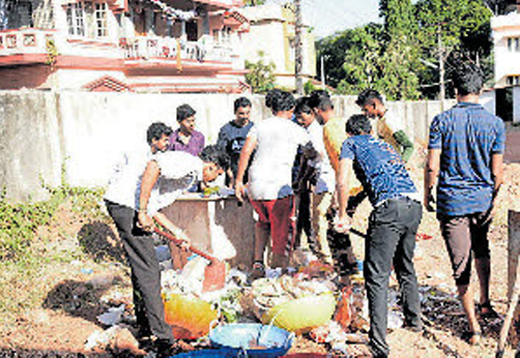 Mangaluru , Jan 27, 2017: Again at least Seven places were cleaned as part of Swacch Mangaluru Abhiyan organised by Ramakrishna Mission, Mangaluru. At Yeyyadi-Maryhill, the members of Friends Forever team took up the cleanliness drive in Maryhill and Airport road. Under the guidance of Shubhoday Alva, team of employees of Shalimar Paints cleaned the heaps of stones and mud beside the main road. The members of Sri Subramanya Sabha carried out the drive in Pintos Lane. The compound walls of Capuchchin Church were painted with awareness messages. The members of Team Garodi carried out the cleanliness drive in Capitanio area. Two bus shelters were thoroughly cleaned and renovated. Students of Capitanio School cleaned the road and adjoining drains. The members of Nivedita Balaga took up the cleanliness drive in Monkey Stand area. They cleaned the road and adjoining drains and cleared heaps of garbage. The members also visited the houses to create awareness on seggregation of garbage. On Car Street, the students of GFGC Car Street took up the drive. Students of the college cleaned the road leading from School Book Company to New Field Street. The NSS students of KPT took up the drive in KPT area. One group cleaned the KPT Circle area while others cleaned the road leading to Airport. Huge logs of wood lying on the footpath for the past three years were cleared. The students of Mangalore University took up the drive in Konaje. PG students cleaned the bus shelter in the area and the roads leading to the stand. They went from door to door creating awareness. This is a good move. We have to take up this task with our heart and minds. We have to make up the habit of disposing waste. We have been successful in attaining the credit if Swacch Mangaluru. Many of them are still not aware of certain facts .